If you’re still flying metal blades, experience the difference new technology can make on your Huey. VHA’s composite UH-1 tail rotor blades use an advanced cambered airfoil that improves stall margin, increases tail rotor authority and decreases vibration. The VHA UH-1 tail rotor blade features carbon fiber spar and skins, fiberglass root fittings, and a stainless steel abrasion strip. The all-composite construction results in a lighter but stronger rotor blade that resists both corrosion and impact damage. Although VHA’s UH-1 tail rotor blade is nearly one-inch wider than the OEM blade, no modification to the tail rotor hub is required for installation. The VHA UH-1 tail rotor blade is available through our VHA distributor network. Note: The -103 blade is not interchangeable with the -101 blade. A full set of either -101 or -103 blades must be installed. UH-1 blades ordered after October 25, 2017 are shipped as -103 blades. 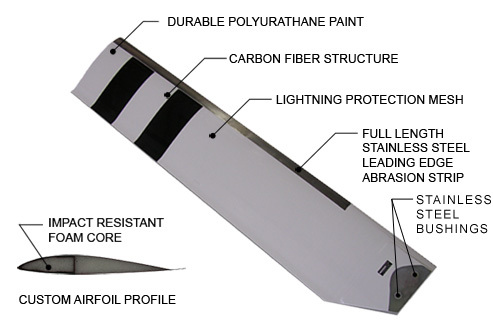 VHA composite tail rotor blades are certified for installation on the UH-1 models listed below. To download the Supplemental Type Certificate (STC), Approved Model List (AML), Instructions for Continued Airworthiness (ICA) or Flight Manual Supplement (FMS) for your UH-1 Model, Please visit our Documents page.